Ryght so [Arthur] sought, and his knyghtes, towarde Sandewyche where he founde before hym many galyard [sturdy] knyghtes—for there were the moste part of all the Rounde Table redy on tho bankes for to sayle whan the Kynge lyked. Than in all haste that myght be, they shypped their horsis and harneyse and all maner of ordynaunce that fallyth for the [war]–and tentys and pavylons many were trussed–and so they shotte frome the bankes many grete caryckes and many shyppes of forestage, with coggis and galeyes–and spynnesse full noble with galeyes–and galyottys rowyng with many ores. And thus they strekyn forth into the stremys, many [valiant hundreds]. In the Norton edition of Malory’s Le Morte Darthur, editor Stephen Shepherd provides a footnote for the word “bankes,” suggesting that it means “shore.” This makes a certain sense as Arthur and his knights are readying to set sail across the English Channel with their ships of war. It fits, too, with the fact that Sandwich was once closer to the sea than its present location as a quiet river town, now two miles from the ocean. The harbor in medieval times was called Sandwich Haven and it was a port deep enough for large commercial and war ships. Still . . .the text says ready on the bankes . . .
After my arrival at the pub in Sandwich, I take an evening walk on this long, northern summer’s evening along the peaceful River Stour. In contrast to the intensity of York, London, and Canterbury, I enjoy a solitary walk along the river. The July sun is low in the sky and a brisk breeze with a slight tang of salt and sea disturbs the surface of the river. I try to imagine the intensity of the river quay in Malory’s tale–war ships being actively provisioned, horses–high-strung and trembling with anticipation–stomping and clattering onboard the wooden ships. Testosterone and horse sweat filled the air. It suddenly makes sense to me, as it often does when I set the text in the context of an actual landscape: the relative calm of the banks of the River Stour with its near-access to the sea would provide an ideal point of departure rather than a harbor directly on the coast. Just two miles downstream (north) of Sandwich is Richborough Port, now an industrial park and site of a nuclear power plant. It had functioned as a natural harbor for centuries and was the landing site of the Roman invasion in 43 BC; there are remains of a Roman fortress there still. As I walk along the river, I can see the massive cooling towers and feel the juxtaposition of modern energy production and bucolic ethos of this ancient river. 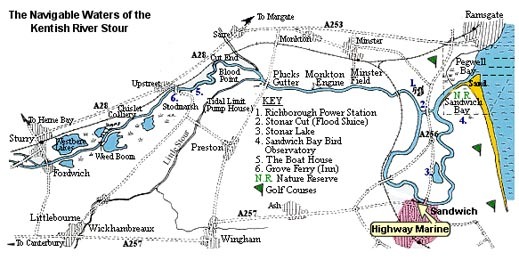 Like Sandwich Haven, Richborough Port has silted in, but as recently as WWI it served as a secret point of embarkation for English troops crossing the Channel to France and Flanders. Then, as in Arthur’s time, the riverbanks provided a protected harbor where ships could be packed with arms and provisions, and where men steeled themselves for a journey of war. My entry to the New Inn pub earlier this evening was similarly a gender-inflected moment: to me, pubs are still predominantly a man’s space. As I waited to get my key, I stood at the bar and chatted with three young men and an older gent, asking for directions to the river. Their directions were hopelessly confusing, but it was fun to have an excuse to be in a space that I would not normally feel able to enter on my own. In Malory’s time, Sandwich was invaded by French troops (1457) s o its role as a martial city would have been fresh in Malory’ mind, especially as he himself was a knight-at-arms. As a port city, it was also the site of exotic contact with far lands: in 1257, apparently, the first elephant was brought to England causing, one can imagine, an incredible stir. 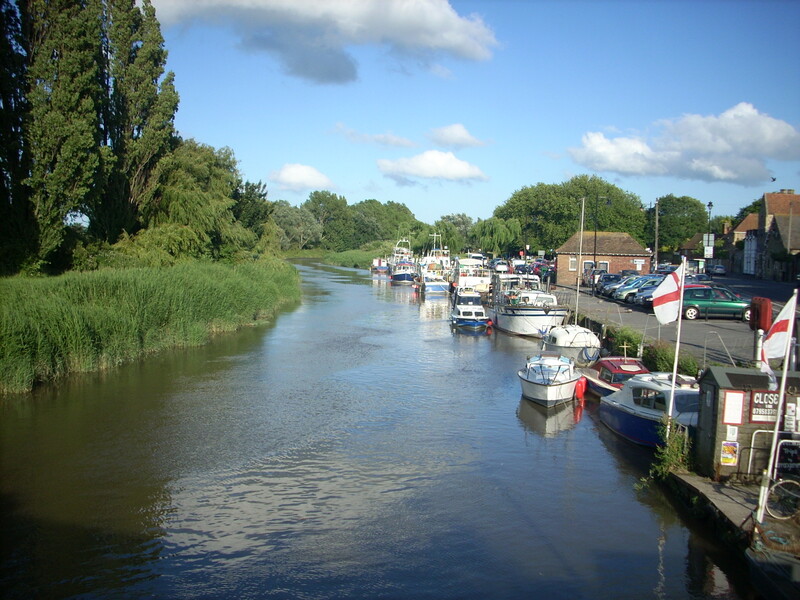 Today, Sandwich is a quiet town along the winding River Stour. The placid, curving river is lined with rushes and small pleasure boats; pathways, marshes, and small woodlands form part of the river’s geography. 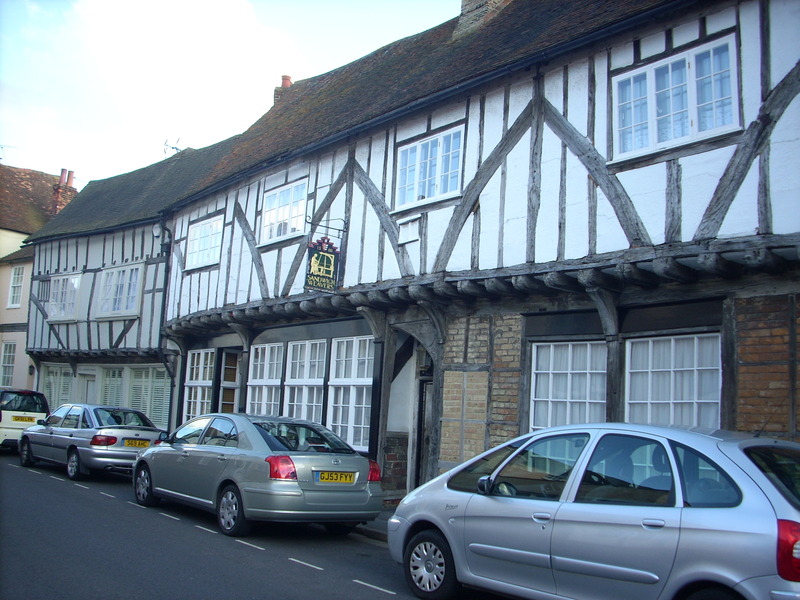 In the town, there are quaint medieval houses and shops that lean over narrow cobble streets. 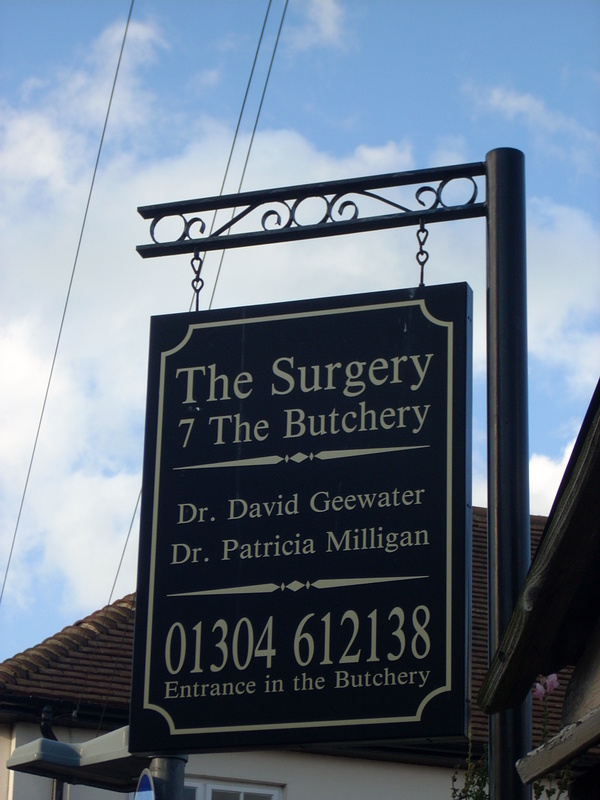 A surgeon’s office, I kid you not, is located on Butchery Lane. 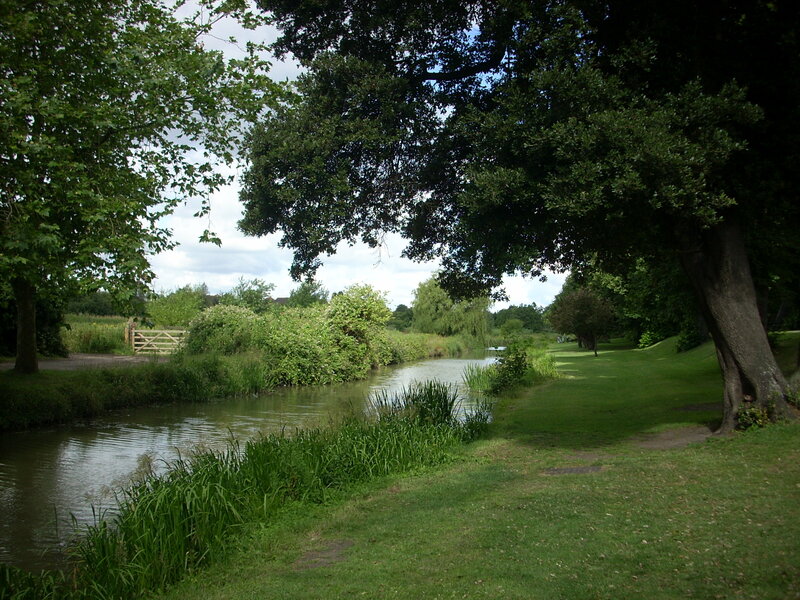 Of course, Sandwich is not only an idealized town, but part of the modern British landscape. Still, walking alongside the river, it is not hard to conjure the sense of a landscape with links to a far past. Sandwich seems to have an authentic ‘self-ness’. There are some tourists, mostly middle age British couples, but the town feels like it has a sense of its own self–with practical shops that sell shoes and bread boxes, flowers and groceries. The next morning–a Saturday–elderly women in their 70s and 80s ride their bicycles into the town center, their empty grocery bags tucked into the front basket of their bikes. I go for a run along the river, glorying in a beautiful sunny day and the cool, fresh air. At the quay, I read a small sign from the harbor master, who also offers boat tours. I am sore tempted to stay for his 11 am tour, but I must catch a train to the ferry in Dover and then make a long drive from Calais to Rennes, France. Alas! that I only gave myself an evening and a morning in Sandwich!